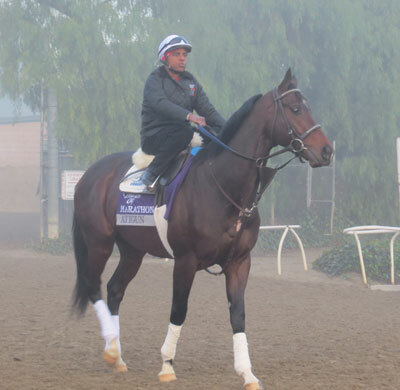 With Santa Anita shrouded in fog for most of the morning, Breeders’ Cup horses went about their business as usual, as many of the Europeans took to the track for the first time. At 1:30 in the afternoon, the final shipment of horses arrived…finally, having escaped from New York on a flight from Stewart Air Force Base in Newburgh, N.Y. 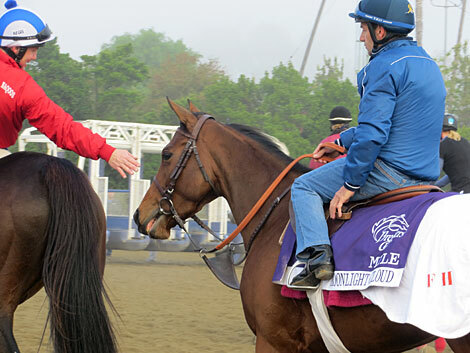 Among the group were Classic contenders Mucho Macho Man and Fort Larned, as well as longshot Brilliant Speed. On the same van as Brilliant Speed was the BC Mile favorite Wise Dan, who was led into his barn by trainer Charlie Lopresti. Fort Larned traveled on the same van as the Todd Pletcher-trained horses, including the undefeated Champagne winner Shanghai Bobby. 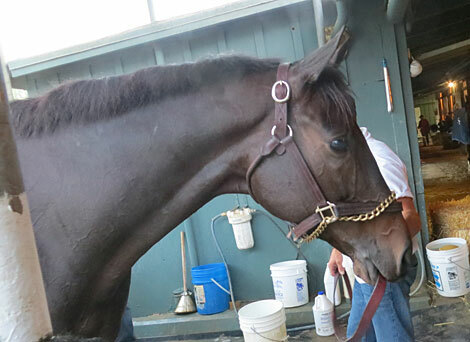 Fort Larned was met by trainer Ian Wilkes and his wife Tracy. The first thing Wilkes did was to check to see if the colt had gotten hot during the trip. Some analysts question whether a mile and a quarter will suit Fort Larned, the Whitney and Cornhusker winner who tired to finish third in the 10-furlong Jockey Club Gold Cup after challenging for the lead turning for home. 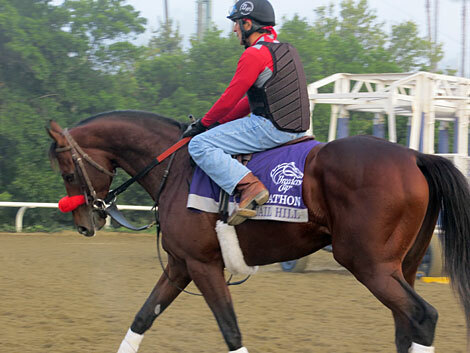 But that premise may prove to be misguided, as Fort Larned, who didn’t seem to handle the deepish track at Belmont that day, is bred to excel not only at the Classic distance, but at Santa Anita. The 4-year-old colt’s second dam is Hall of Famer Bayakoa, who won three grade I stakes at Santa Anita. His broodmare sire, Broad Brush, won the Santa Anita Handicap. Broad Brush’s sire, Ack Ack also won the Santa Anita Handicap. His sire E Dubai is out of a mare by Lord at War, who won the Santa Anita Handicap. 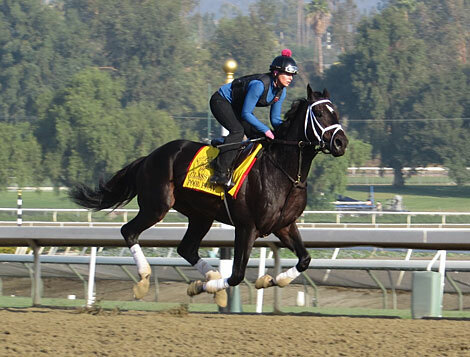 He also traces to Bold Bidder, who won the mile and a quarter Strub Stakes at Santa Anita. E Dubai won the mile and a quarter Super Derby and finished second to Thunder Gulch in the 10-furlong Travers Stakes. So there is certainly enough to suggest that Fort Larned will have no trouble handling a mile and a quarter, especially at Santa Anita. Brilliant Speed, who we wrote about in a column last week, looked terrific getting off the van. His coat was resplendent and he came off the van with good energy, bouncing along. One Classic horse who has looked good galloping in the morning is Alpha, who may be the ignored Travers winner in a long while. 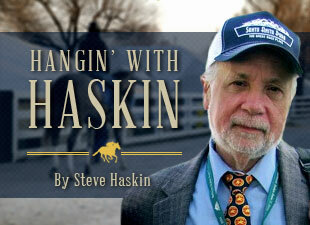 Here is a horse who is rarely talked about in any conversation involving the Classic. His Thoro-Graph numbers don’t quite match up with these horses, but he is a classy colt who has turned in several top performances and can be placed anywhere on the track. Pool Play had another strong gallop Wednesday. 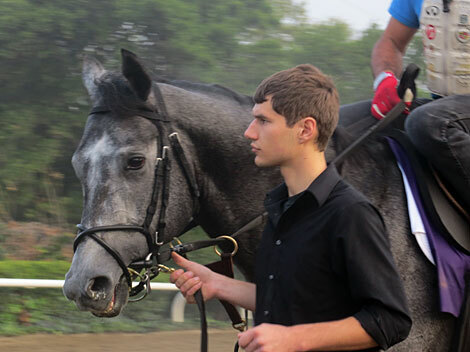 Euro invader Sky Lantern will be tough in BC Juvenile Fillies Turf. Point of Entry coming through the fog following his gallop. 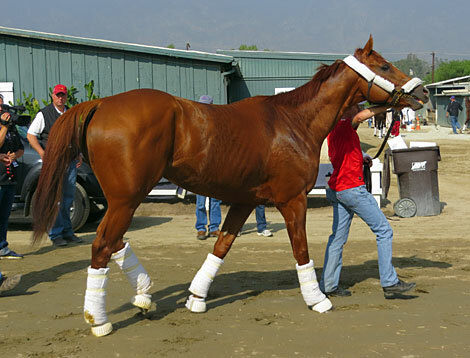 Wise Dan arrives at Santa Anita. 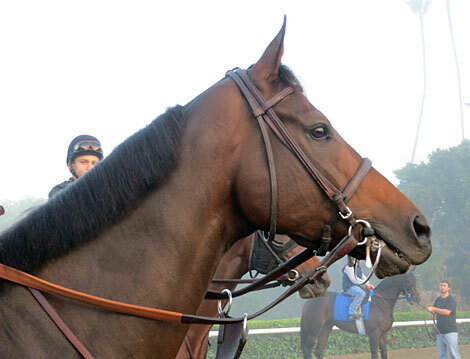 Game On Dude as bright and alert as always. 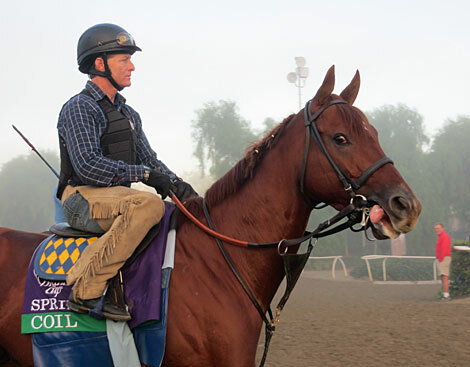 Coil, one of three Bob Baffert horses in the Sprint. Longshot Quail Hill could set the pace in the Marathon. Vosburgh winner The Lumber Guy is getting awfully good right now. Smile winner Gantry constantly needs something in his mouth. 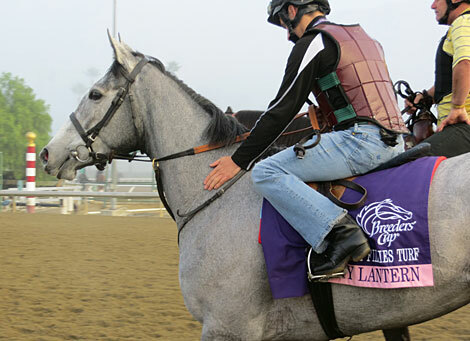 By popular demand, another shot of Gantry in his Breeders' Cup saddle towel. Brilliant Speed looked great coming off the van. Fort Larned settles in after arriving Wednesday. 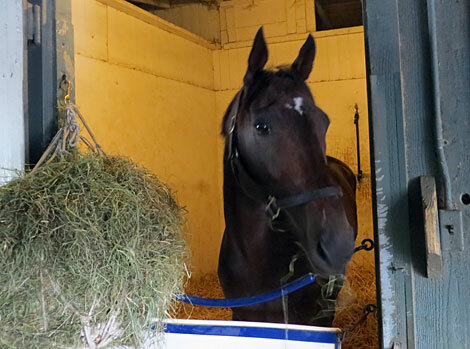 Could Questing be the forgotten filly in the Ladies Classic? The 3-year-old Atigun could be the Marathon favorite. Group I winner Moonlight Cloud came within a head of defeating Black Caviar this year. 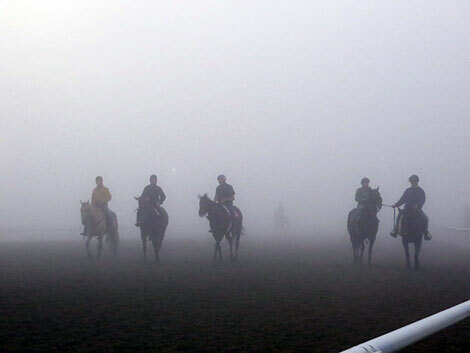 Foggy morning at Santa Anita.